Ever since I can remember, I was never one for voluminous locks. When it comes to style, the straight and sleek look is more my thing, and what I usually go for. A couple of weeks ago I received a few Rock Your Hair products for review-a line designed by celebrity hairstylist Michael O' Rourke, and I have to say, since using these and putting them to the test, I think I am slowly beginning to build an appreciation for volume. After all, a little oomph in the hair department never hurt anybody. Before I get into the individual product reviews I just have to take a moment and gush over the super adorable bottle packaging. I just love the bright pink coloring of the bottles, and the shiny heart-shaped studs. So girly and glam! 1. Big Hair Rocks Shampoo ($17.00 for full size bottle) And Big Hair Rocks Conditioner ($20.00 for full size bottle): The volumizing shampoo is paraben and sulfate free, and it does a nice job at cleansing my hair without being harsh and stripping it of essential moisture. I love the fresh scent of this and for being sulfate free, I was pretty impressed with the amount of lather this silky shampoo produced. 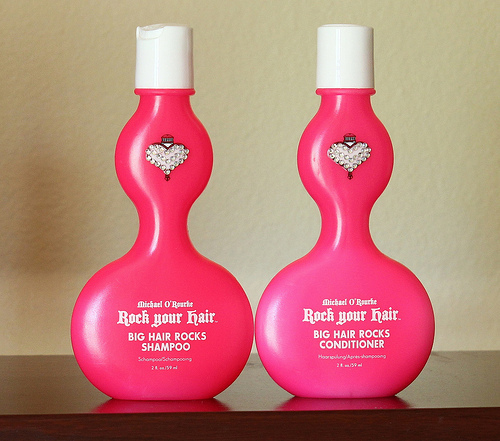 Like the shampoo, the big hair rocks conditioner is also paraben and sulfate free. For my thick hair, I find that a quarter sized amount of conditioner is enough for me to distribute onto my hair, making sure to concentrate the most product on the shaft and ends of the hair. I let the conditioner sit in my hair for about 3-5 minutes before I am ready to rinse it out. When I rinse, right away I can feel a smoothness in my hair, that's luxurious to the touch. Because of this shampoo and conditioner duo, I have definitely noticed that my hair has more body and bounce than it usually does, after I blow dry and style. 2. Miracle Leave In Conditioner Weightless Detangler ($20.00): This detangler contains soy, wheat and oat proteins to help strengthen hair from the shaft to the ends. This product is great for replenishing moisture to dry locks and it's great for all hair types, including color treated. I spritz a bit of this all over my towel dried hair, then proceed to comb through it. And thanks to this, detangling my hair is a much more manageable/bearable process. The only thing I am not crazy about is the fragrance of this. I wish it had a fresher scent. 3. Bombshell Big Hair Powder ($17.00): I have never used a volumizing hair powder before so I was excited to see what this could do. I just sprinkle a bit of this talc and Micah based powder onto my limp roots, and I love how this gives my hair not only a nice lift, but some added texture to boot. This hair powder is lightweight, and it's so cool how it liquefies once you start working it into the roots. 4. 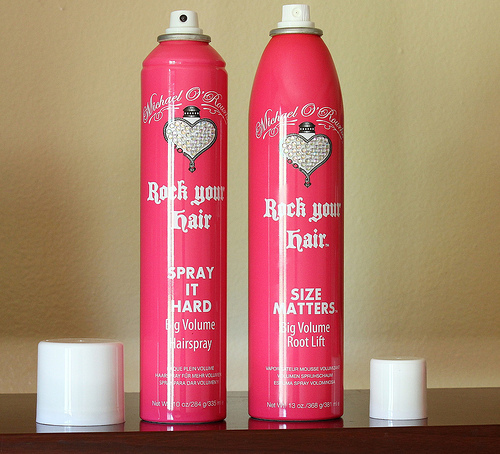 Spray it Hard Big Volume Hairspray ($22.00): I am really fond of this hair spray. In fact, it has become one of my most reached for hair products. This gives my hair a shiny, flexible hold that prolongs all day. It doesn't make my hair feel crunchy or weighed down, either, which is a plus. I have tried my fair share of hair sprays and most of the ones I have encountered have caused flaking, which I totally hate. Well, I am happy to report that this hairspray does not flake on my hair, whatsoever. Score! 5. Size Matters Big Volume Root Lift ($20.00): Before blow drying and styling, I like to spritz a bit of this humidity resistant spray mousse on my damp roots, to give it some extra volume. And, this product doesn't weigh down the hair, either. A little spray goes a long way. Find out more at www.rockyourhair.com! 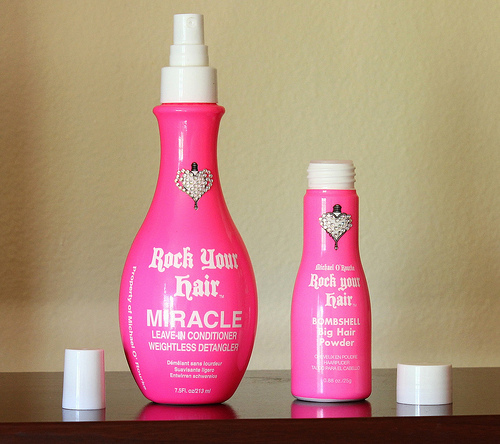 What do you all think of the Rock Your Hair products? Any favorites? Disclaimer: I received the products mentioned in this post from PR for review consideration. I am not being monetarily compensated for this review and as always, my opinions are honest, never influenced, and my own.